Would you prefer an ultra supportive and stylish cream nursing bra? If so, we recommend the Royce Ava Nursing Bra, which is cream with black spots. So, why is this bra so supportive? Well, it is crafted from a strong, stretch fabric and it also has side slings to further boost support. It should give you a nice shape to the bust too. 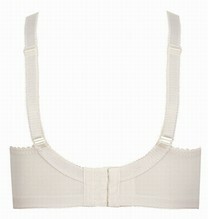 We think you should also find it really comfortable too thanks to the cotton lining in this bra. It has a wide form-fitting underband as well as easy drop clips and soft cups. It is widely recommended that you should, if possible, avoid underwires during your nursing months. So you may be pleased to know that this bra is wirefree. Royce have also made this bra very pretty with a spot print and a lovely lace trim. It is also available in black with cream spots...see below for this option. So why do we think you will find this bra such a good choice? Well, it is very supportive, really pretty and comfortable too.